After graduating, students in social work are faced with the daunting and stressful decision of choosing their specialty from the many that are available to them. JessicaRosenberg has designed this guidebook to make this process easier, providing students with real world and practical information about what it is really like to work as a social worker. Each chapter covers a different practice setting, such as child welfare, gerontology, and addictions, and follows the same format. The Field Overview and Forecast describes the social worker's role, scope of services, and emerging issues and employment trends. The Critical Issues section consists of an interview with an established professional in his or her chosen field, offering a look into their personal journeys as they progressed through their careers. A vignette written by a practitioner in their area of specialty makes-up the First Person Narrative, providing the reader with a look at the joys and challenges of working in that particular field. Each chapter then concludes with helpful resources to learn more, such as books and websites, as well as information about specialty credentials and educational programs and centres. 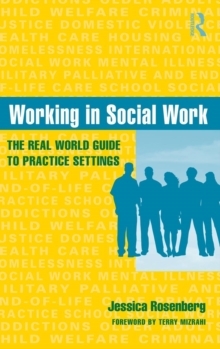 Those entering the social work field will find this an indispensible guide as they select their specialty and begin their career.